6:45am - The making of reservations, for us on the Scampy RV Team, changes the wonder of our quest to search for adventure along our journey. Yesterday we became aware that RV parks along the Northern California Coast Route became overwhelmed with RVers during weekends. So, we paid for an additional day's stay here at Bodega Bay Marina and RV Park for today, Saturday. Also yesterday, we made a reservation to stay at Salt Point State Park, north of the Town of Jenner for tomorrow, Sunday. Why did we make these reservations? Because we were afraid! Yes, were fearful of not being find our Nite Camp!! No more reservations for us! No more fear! We will journey along the Pacific coast confident that we shall find our Nite Camps. We have been learning how to make better pics with iPhone. 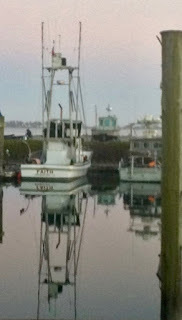 Yesterday we Blogged to you a pic of a fishing boat across from our camp site. This pic was captured during daylight. 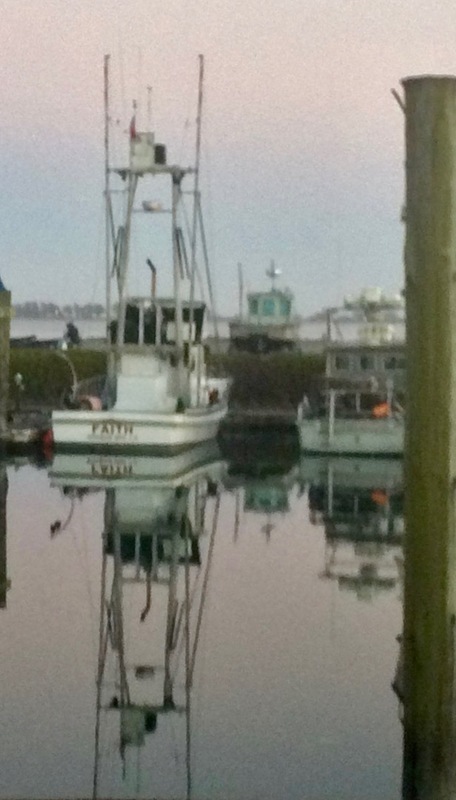 Later on, iPhone captured the same fishing boat. But this time, just before dusk. We made a nice breakfast this morning. 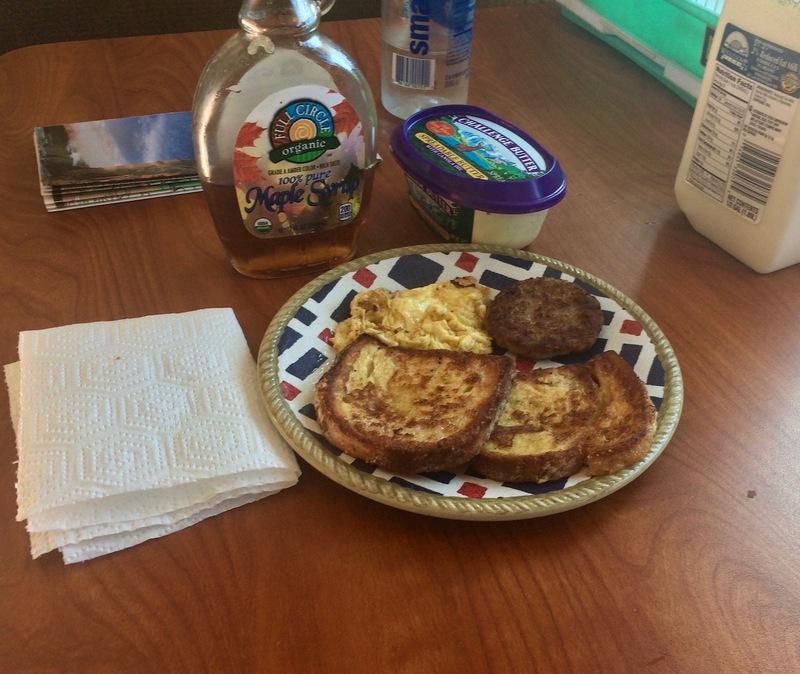 French toast, sausage and scrambled egg. Yummm! Ever since I bought Scampy, passers by would ask, "How much did you pay for your Scamp?" I would reply, "Scamp trailers start out at $10,500." After awhile I began to lower the $10,500. First to $8,000. And I still received a Wow! response. Then to $5,000. Then to $3,000. Still got a, "Wow!" Or maybe a, "That much?" Now I don't give a price. I ask, "How much would you pay for a Scamp?" Well, I guess that I am. I learned about being a Vagabonder Supreme back in the olden days of 2003 and 2004. That was before all of these "No RV Camping" signs appeared on OUR roadways! Don't forget next weekend is Memorial Day weekend. I did not remember about that. George, what I have read in blogs from others who are RVing across the US is that they find a convenient campsite a few days before the chaos and confusion of all the Memorial Day traffic begin and stay put until it is over. It is virtually a cattle drive with nowhere to camp (officially or unofficially) available. When everybody is flocking to the beach, the Scampy Team likely will head inland for the Memorial weekend. She almost never pays for campsites and stays mostly on Forest Service or Bureau of Land Management property in what they call "dispersed camping." WHen she does pay for a campsite, it is only a few dollars per day--as low as $3-$5. Thanks for that info. I know about RVSue. Dispersed camping is great. But, you gotta be in a place where there is dispersed camping available. I read the other day that there are a lot more rv's now then in the past. I've heard that along the Ca coast that there is a problem finding a park spot in the summer. So it might be the wise thing to make a reservation now and then. Well, I guess that I am just going to have to deal with that. I'll post about what happens. Are you thinking about the date that I first began Blogging? That date is May 14th. Or are you thinking about the date that I was born? November 27th? I finally figured it out, George. I should have wished my other favorite George...of Our Awesome Travels...George Yates a Happy Birthday. I have corrected my notes. Thanks, George. The pic from the iPhone probably looks fantastic on the phone but it seems you might have made it too small on the blog. I would love to see the original photo. The reflection looks so clear. Using your browser's "View>Zoom" option, you may make a image bigger. I was just going to say that some state and national parks have overflow areas. They are just parking lots, but that's all you need anyway. I am confident you will find a place to spend the holiday weekend, even if it is an overflow lot. You might also ask small town shop owners if they have suggestions. Small towns are harder to hide in, but they are a lot more friendly than big towns! I really like that you have confidence in my finding a place to camp during the upcoming holiday when RVers from cities and towns will be heading for the ocean.